Jordan Brand is set to release another edition of the Air Jordan Spizike, which has been tried and tested as a fan-favorite during the previous releases of this shoe. Recently, a new colorway has surfaced, which is rumored for release soon but Jordan Brand did not give an exact release date. 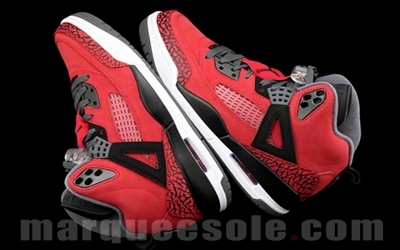 Listed as the Red/Black colorway of the shoe, this new Air Jordan Spizike is obviously a Chicago Bulls-themed edition, which will make more appealing to the eye as proven by the warm reception of the previous kick that came out in Bulls-themed editions. No specific release date for now, but Jordans Out will keep you updated! Air Jordan Spizike “Bordeaux” Coming Out This Saturday!